As a comforting balm for our weary world, Pizza Hut today launched a beer and wine delivery pilot program in Phoenix. Phoenicians can now order up a six-pack of Bud Light, Budweiser, Shock Top, and Four Peaks Kilt Lifter. Praise be. 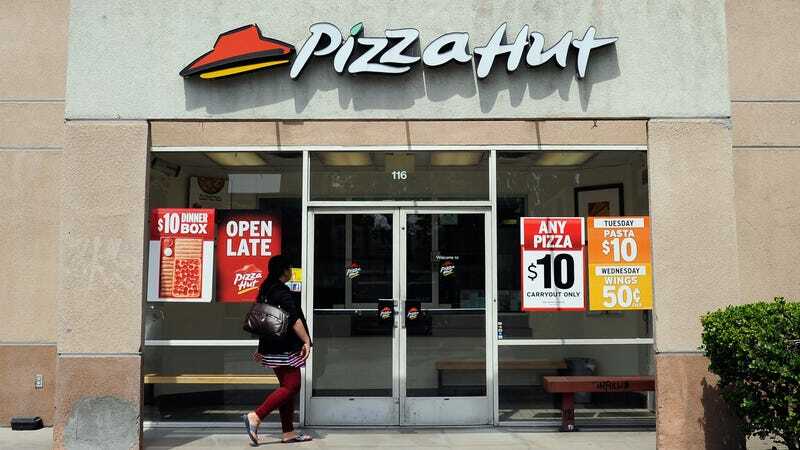 A Pizza Hut spokesperson tells The Takeout that the pilot program is just the first in a quick expansion of beer and wine delivery launching at more Pizza Hut locations next year. Some Pizza Huts already carry beer and wine licenses (about a quarter of all U.S. Pizza Huts, according to Nation’s Restaurant News), making it easy for those locations to just tack on a six-pack or bottle of wine to your delivery order. For locations that do not already have beer and wine licenses, a spokesperson tells The Takeout Pizza Hut is exploring local laws to see how the pizza chain can work within them to offer this service at more locations. Pizza Hut drivers in Phoenix who will be making alcohol deliveries have all passed a state beverage server training as well as additional in-store training on how to verify IDs. Drivers will also require alcohol-delivery customers to fill out a form at the time of delivery that asks for their ID number and signature. That form that will then kept on file at the restaurant per state law, according to a Pizza Hut spokesperson. The chain plans to keep all alcohol delivery in-house, meaning the same drivers who deliver pizza will also drop off your six-pack. This is different from some other restaurants, which use a third-party service like Lash or DoorDash to deliver food and booze. Business Insider reports that Lash drivers delivering TGI Friday’s orders containing food and alcohol actually stop at a liquor store to pick up the booze, then collect the food portion and drink mixers at TGI Friday’s before delivering them to the customer. Obviously, the in-house delivery team seems preferable, as any extra moment spent waiting for a Supreme and a six-pack is a moment too long.